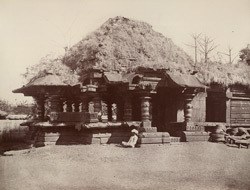 Photograph of the second Jaina temple in front of the fort at Belgaum in Karnataka, taken by Thomas Biggs in 1855, from 'Architecture in Dharwar and Mysore'. In northern Karnataka: now the districts of Belgaum, Bijapur, Bidar, Raichur, Dharwar and Gulbarga, temple construction proliferated during the period of the Chalukyas of Kalyana who were the chief power in the Deccan from the 10th to the 12th century. Innovative builders, their influence continued to inspire dynasties such the Hoysalas who took over their territory and were also avid builders. Jainism always remained a significant force in this region and the various dynasties of the Deccan such as the Chalukyas, Rashtrakutas, Hoysalas, Gangas, Kadambas and Rattas also patronised the Jaina religion. With the result that there are many Jaina temples at numerous medieval sites of Karnataka. In the Bombay List of 1874, Henry Cousens wrote, 'Within the fort of Belgaum there are three old Jaina temples, built, as indicated by the style, about the year 1200 A.D.' The temple in this view consists of a shrine, a closed hall and an open hall. The shrine of the temple has walls with plain, horizontal mouldings and a stepped, pyramidal roof. The open hall or mandapa has a low parapet-wall and a pyramidal roof supported by lathe-turned pillars.